A vestry meeting was held at the Town Hall on 23 August 1866 subsequent to the Sanitary Act of 1866 to discuss how the water supply to the inhabitants of Chudleigh town might be improved. At that point in time many properties benefitted from their own wells and there were numerous springs available but the main supply to the town was the old leat or pot water. As an open channel of some six miles distance the course of the leat was subject to pollution from a variety of sources as it passed along its route from the spring at Oxencombe in the north of the parish and was now the focus of the intended improvements. Looking back at the old records it is apparent that funds were always an issue and even though loans were taken it seems that the cheaper options were usually adopted which meant that the improvements could have been better than they turned out to be. The vestry formed a Sanitary Committee and it was that committee that from then on made the decisions and had the work done. It was only with the passing of the Parish Councils Act in 1894 that overall responsibility moved from the parish to the Newton Abbot Rural District Council. At the first and subsequent meetings it was decided (following detailed engineer's reports) that the leat would be left open but run into a reservoir at the head of the town where it would be filtered and then distributed to the town in pipes. These pipes would then supply public taps in the principal streets. The site chosen for the reservoir was at the top of Old Exeter Street in a field belonging to Mr William Bower Scott. He donated the land, named Boyerhole Meadow and the reservoir was duly built. Measuring 90 feet in length and 18 feet in width its base was of concrete with masonry walls. The whole structure was covered with a double arched roof supported in the centre by iron uprights. A portion of the reservoir, 12 feet in length, was separated from the remainder by a masonry partition thus forming a separate tank into which the water passed from the large tank through a filter-bed. This small tank was calculated to supply about 21,000 gallons of water per day or 10 gallons for each individual of the population. The work was carried out by Mr Foaden of Ashburton and cost £234. The supplying and laying of pipes from the reservoir into and around the town, the taps for public use and other charges brought the total cost to the parish of £569 18s 9d. However, the new system was not a success and almost from the outset the committee received complaints about the impurity of the water. A case of low fever in Mill Lane in early 1878 brought matters to the fore and a medical officer was called in to carry out tests on the water at various points. The results clearly showed that the water was polluted and a remedy had to be brought about. On 5 June 1878 a vestry meeting was held at the Town Hall to hear the medical officer report and consider the way forward. A loan of £1300 was applied for to carry out the necessary works. Close by the Oxencombe spring was another, called the Kennel Spring lying on the Whiteway Estate and at that time in the ownership of the Dowager Countess of Morley. In addition to granting the use of the spring for the improved town supply she initially allowed 20,000 gallons per 24 hours to be taken from it. Pipes were laid to covey the water from the spring to the Boyerhole Reservoir following a lower course than that of the leat and over a much shorter distance (two miles as opposed to six). 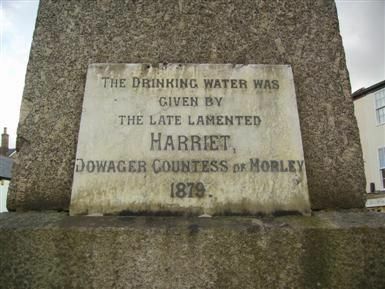 A plaque commemorating the gift of water in 1879 was placed on the obelisk following the Dowagers death in 1897, as shown below. The medical officer said that as the Kennel Spring provided hard water it should never be mixed with that from the original spring, that being a soft water supply. With this in mind the leat water was then diverted to by-pass the reservoir with only the new piped supply from Kennel Spring entering it. From this point the town enjoyed two distinct water supplies and evidence remains on the obelisk to show where two of the taps were located. 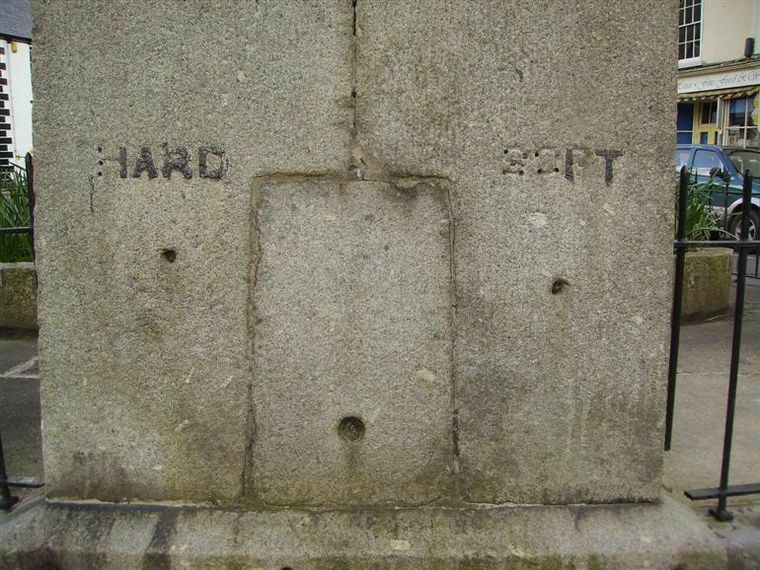 The words 'HARD' and 'SOFT' may still be seen cut into the stone base as shown below. The ongoing systems seem to have worked reasonably well but as time passed and the population increased the water supply became insufficient and matters were made worse as there were often leakages and water wastage became a problem for the committee. By 1900 there was a move to do away with the public taps and bring water into the homes of the inhabitants. This met with strong objection as to obtain water from a public tap meant it was free whereas to have a supply in your home a rate would have to be paid. A few more years passed and it became apparent that the amount of water needed on a daily basis was more than that supplied added to which the Boyerhole Reservoir had seen better days and so the Earl of Morley was approached with a view to increasing the daily supply and to build a new reservoir to replace the existing one. In April 1903 a new reservoir was proposed (to be built near Harcombe Kilns) and permission granted from Lord Morley that the daily allowance of water may be increased to 40,000 gallons. An indenture was drawn up on 13 January 1904 which stipulated that a measuring device be installed at the spring to ensure the water use did not exceed the stated amount and that the lease would be for one thousand years at a rent of 10s per annum. Work on the new reservoir at Harcombe Kilns started on 25 July 1904 and was completed on 26 November in the same year. The reservoir was partly underground as at was built into a hillside and over its roof was built a small structure which housed the chlorination plant. Nearby were the isolating valves and meter reading facilities. Another set of isolating valves were located at the junction of New Exeter Street and Colway Lane. When the new system was introduced the thirteen public taps in the town were cut off and over time supplies put into individual houses. At this point the system was under the control of the Newton Abbot Rural District Council who employed a local water bailiff whose job it was to oversee the smooth running of the system, including the chlorination, meter readings, checking for water wastage/leaks and the operation of the diverting valves as required. The system was certainly an improvement over those previously but it did not come without its problems. The chlorination plant was not particularly effective and would often cause blockages in the chloros chamber leading to untreated water finding its way into the system. The spring head sump also needed close attention as the system was reliant on gravity and any disturbance there would result in a loss of the flow. The spring usually provided a constant source although one particularly dry summer in the 1950s necessitated water being pumped in from the adjacent Bramble Brook to supplement the supply. In 1963 The South West Devon Water Board was formed and not long afterward proposals for a new A38 by-pass of the town were announced and so plans were put in place to realign the water system. By 1966 the service pipes from the Rock Lane reservoir were severed and the town linked in to the trunk mains which had its source at the Kennick Reservoir above Hennock in the Teign Valley. This change replaced the locally sourced water that together with the town leat had supplied the town for well over 500 years. Today the little evidence above ground that remains of the 1866–1966 systems lie on private property although the overgrown site of the Boyerhole Reservoir at the top of Old Exeter Street may be seen without difficulty. 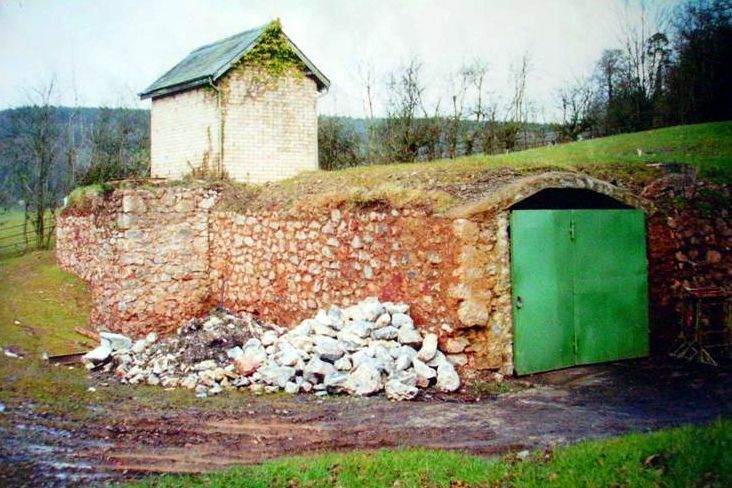 The reservoir of 1903 at Harcombe was converted to a private residence, the following photograph of it was taken in 1995, just before its conversion.